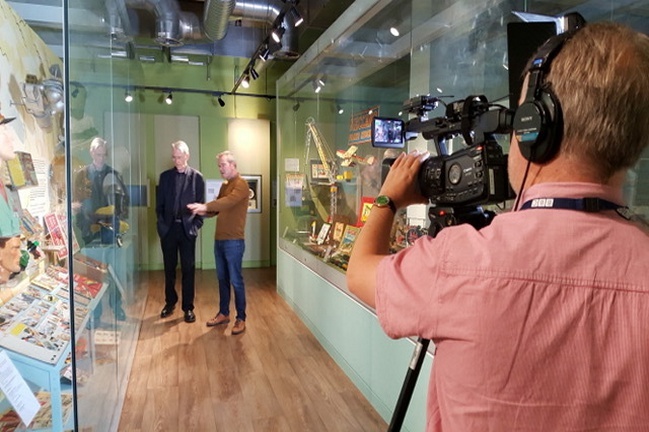 In September, 2017, I was invited by BBC North to take part in the filming of a short documentary about my father and Dan Dare. 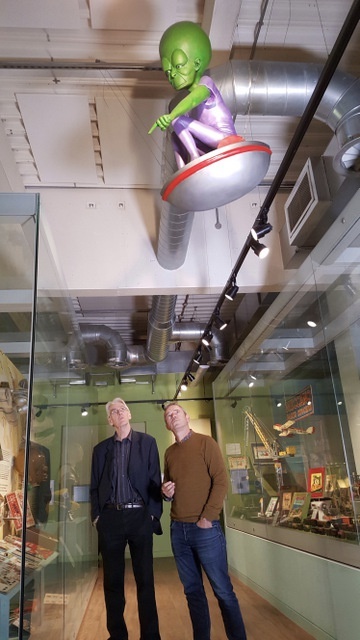 My contribution was filmed in Southport at the Atkinson Art Gallery and in the Old Bakehouse, the original Dan Dare studio. I'd never seen inside the Bakehouse before so this was particularly interesting for me. Not only were the original butler's sink and concrete floor still there but amazingly, so was the original owner - now well into his nineties – who, in 1950, had rented the studio to my dad for 1/6d a week. It was easy to picture my father and his team of artists jammed into that small place, battling to meet publisher's deadlines! Filming inside The Atkinson Gallery - myself and interviewer, actor and presenter Simon O Brien.